"Guatemala, Honduras and El Salvador were not able to do the job of stopping people from leaving their country and coming illegally to the U.S.," Trump tweeted Monday. "We will now begin cutting off, or substantially reducing, the massive foreign aid routinely given to them." 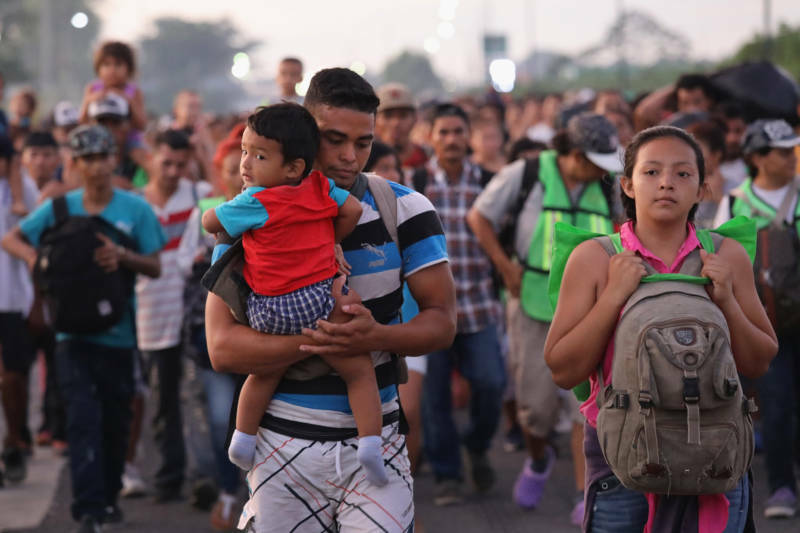 The president's threat comes amid a flood of images of the caravan, which for days has swelled its ranks with people mostly from Honduras. Mexico's National Migration Institute says the Mexican government has processed more than 1,000 refugee claims in the past three days. But that's just a fraction of the caravan that continues to press on. Evaluations of the caravan's size have varied. 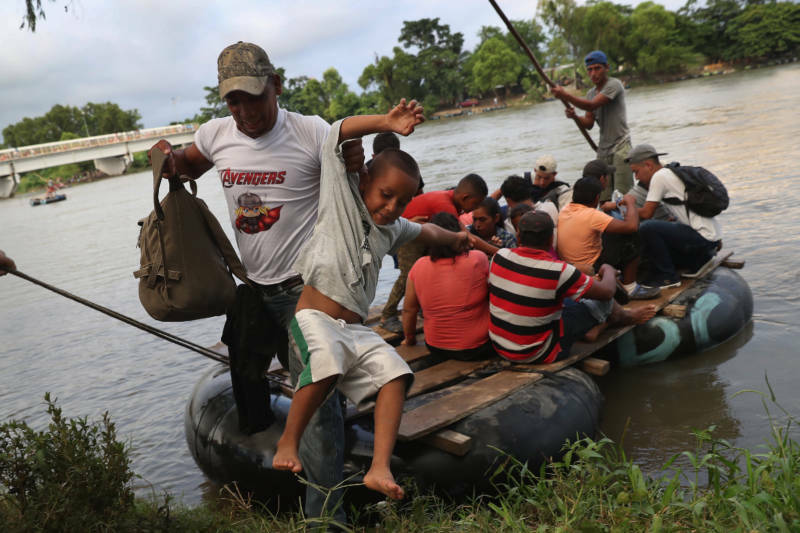 But according to at least one estimate, upward of 7,000 migrants, including families with infants and the elderly, are now tramping north through the sweltering heat of Mexico's Chiapas state, just north of the Guatemalan border. As the group has grown and grappled with the conditions, the migrants have been met with a confused response from Mexican officials. On Sunday, some 200 Mexican riot police arranged a blockade, seeking to block the caravan's path to the city of Tapachula, only to pack up and leave just a few minutes later. 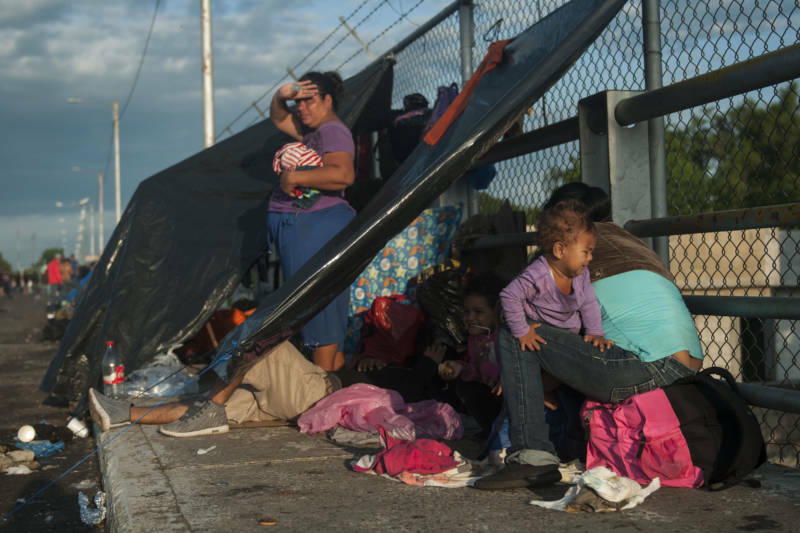 "They just took this blockade away, all the police left and the caravan kept marching," journalist James Fredrick reported for NPR. Trump has made it quite clear he is unhappy about the situation, turning the specter of the caravan into a central element of his campaign stops ahead of next month's midterm elections. "Every time you see a Caravan, or people illegally coming, or attempting to come, into our Country illegally, think of and blame the Democrats for not giving us the votes to change our pathetic Immigration Laws!" Trump tweeted Monday, not long before threatening foreign aid to the migrants' countries of origin. The U.S. has spent nearly $200 million in foreign aid this year for the three countries Trump listed in his tweet — Honduras, El Salvador and Guatemala. The State Department says the money, which is spent in collaboration with programs run by the three countries, aims to promote economic growth, step up security and strengthen the rule of law. In Honduras alone, agricultural investments by the U.S. Agency for International Development "have helped lift 68,000 people out of extreme poverty," according to the U.S. Global Leadership Coalition, a group advocating for stronger international assistance. But Trump has been skeptical of the value of this aid, which he has often used as a point of leverage against certain countries. He specifically called out Honduras and threatened the country during the approach of a similar caravan earlier this year. Last year, he also threatened to cut foreign aid to United Nations member states that voted to condemn the U.S. for moving its embassy in Israel to the disputed city of Jerusalem. Honduras and Guatemala were among just nine countries to side with the U.S. in that U.N. General Assembly vote. "Congress can approve or alter the administration's budgetary proposals and can also specify in substantial detail where it wants the aid to go - even if that's in opposition to what the president wants. "However, in situations where Congress has not gone into specifics, an administration has a considerable amount of flexibility about how exactly it spends the allocated budget - although it has to notify Congress of its intentions." An official at the U.S. Agency for International Development, when contacted by NPR, deferred to the White House when asked for further information. "The president has made clear that countries receiving assistance from the United States should support our interests," the official said. For the migrants themselves, however, such threats are secondary to more pressing matters — namely, the violence they're fleeing and the hunger they're suffering on the road. "The kids are enduring heat. There's no food. We've only eaten because Guatemalans have been good to us," said a man named Samuel, who only gave his first name for fear of retribution at home. He told Fredrick that he was traveling with his wife and three sons — and dismissed claims from Trump and others that the caravan was organized by political actors. "Come on," the man said, "no one told us they'd give us money if we left. My wife and I made this decision." Multiple reporters who have been traveling with the caravan also disputed Trump's assertion — offered without evidence — that "unknown Middle Easterners are mixed in" with the group. Los Angeles Times reporter Kate Linthicum tweeted that she has not seen a single person who fits Trump's description. "Have seen hundreds of women and children and babies, though." "I have to do this for his future," one of those women told the Times while carrying her 18-month-old son. 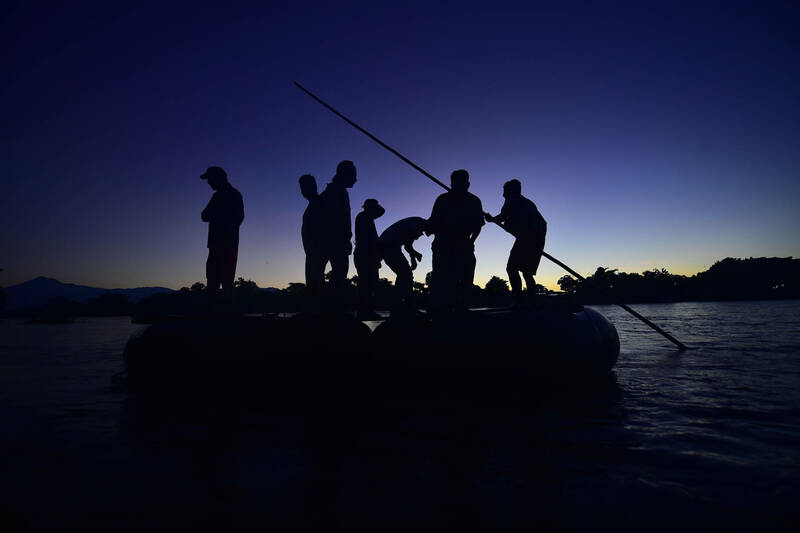 Paola Oviedo said she was one of many migrants who crossed the Suchiate River in rafts after Mexican officials stopped them on the bridge, the legal point of entry from Guatemala. Now, she and thousands of others are in Mexico — but most of them don't plan to stop there. They say they are heading to the U.S. regardless of Trump's statements. 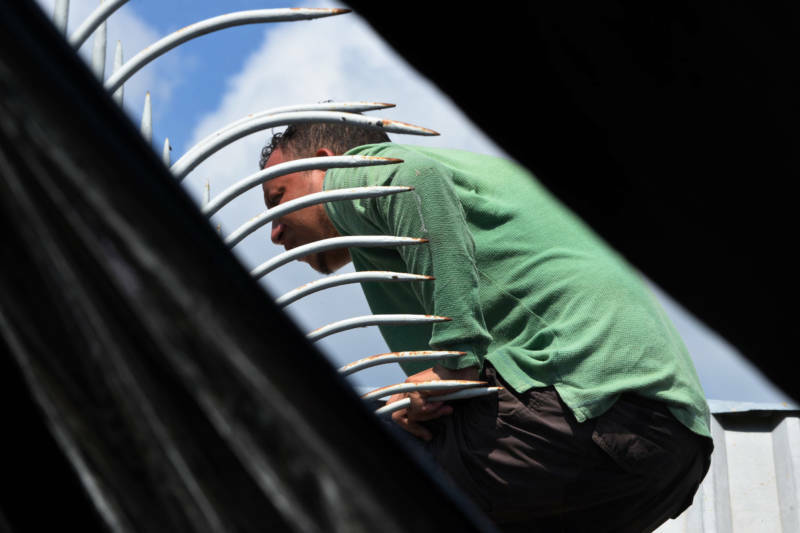 "It is very hard because the heat from the sun is getting us tired," migrant Luis Puerto told The Associated Press. "But we're warriors, and we've got to get to the place we've got to be."